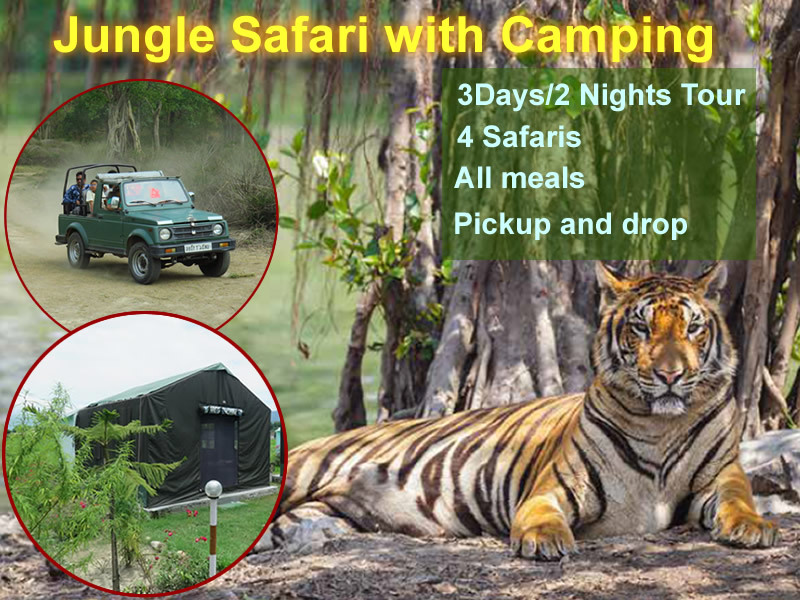 It is 2-3 hours safari by Jeep, in morning time (Gate open: 07-09 am) and in evening time (Gate open 3-5pm) in which you can experience Jungle. 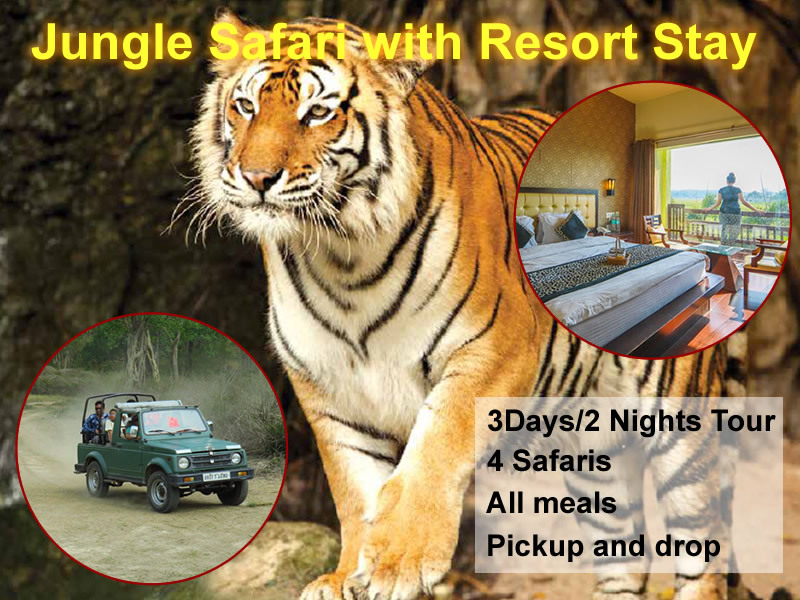 Rajaji Tiger Reserve is a very famous tourist destination located in the India state of Uttarakhand. The region is mainly famous for the Asian Elephant Reserve and Tigers. Main transport options around the reserve are jeeps safaris. Private vehicles are not allowed inside the Reserve forest, and this is one point to note while taking up a trip to Rajaji. At Rajaji you can get the chance of viewing Spotted Deer, Sambhar, Wild Boar, tiger, leopard, Barking deer, Goral Two kinds of Bears Himalayan Black and Sloth, and over 400 bird species makes Rajaji Tiger Reserve a perfect wild life safari and bird watching destination. Complementary: One Child upto 5 years on one Jeep. All charges are without Entry Fees (Rs.150/- per person for Indian, Rs. 600/- per person for Foreign Nationalist) extra as mentioned above. Foreign Nationalist required to keep photo copy of their passport. While filling booking form, also mention the name, age, gender of each group member at Message Text Box. Book early help us to make arrangement properly. Sitting capacity of Jeep is 6 pax at at time. If you are less than 6, we accommodate more people with you, depends on number of booking on particular date and time. If you don't want to share the Jeep with others charges will be extra. Chilla Tourism Zone is much developed and have maximum number of tourists round the year, Motichur Tourism zone is less popular than Chilla but have enough tourists. It is easliy approcheable from NH-72 and just adjecent to National Highway. Ranipur Tourism Zone is less popular than all. Yet no one knows when and where you have luck to see maximum jungle culture. Tourism Zone/Gate Policy has been updated after Hon. 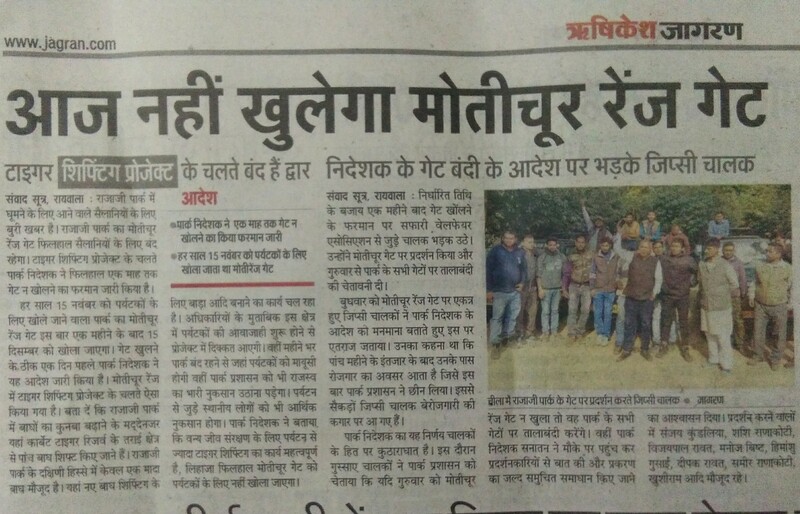 Nainital Hight Court Order on the limits of Gypsies for per zone. Read Policy document here. Forest Rest House not availalbe for common public as per Nanital High Court Order. Pickup from Haridwar by Swift Desire/4 Seater cab will be extra. Pickup from Jollygrant Airport, Dehradun by Swift Desire/4 Seater cab willbe extra. At Ranipur touism zone Leopard visibility Chances are maximum. GST (5%) will be Extra. Rain effect: Some time due to unavoidable reasons like heavy rain, park gate specially Chilla got closed. In this conditions we provide safari on another gates of Rajaji (like Motichur, Jhilmil, Ranipur etc) depend on situations. Or guest may come on another opening schedule of prescribed gate as soon as open by Forest deparment. Refund is not possible in this situation, if guest are not ready to avail alternative solutions.